Steve is a longtime Thompson employee with over 30 years of experience in product support and management. Born in Nashville, Steve grew up in Murfreesboro, TN. He graduated from the University of Tennessee with a Bachelors degree in Business Administration. As he began his career, he worked for construction equipment dealers in the Knoxville area. 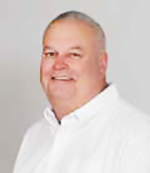 Steve joined Thompson in 1984 in Nashville, initially in sales and later in product support as Service Operations Manager. He moved to the Memphis Area in 1999 to be Thompson’s Service Manager and later West Region Product Support Manager. After moving to Columbus, he served as Product Support Manager for the Mississippi Region. Steve and his wife Margaret have two children. Margaret has a home care business, Serving Our Seniors (SOS). The importance of strong construction and agricultural businesses requires a strong partner. In Columbus, Mississippi, that partner is Thompson Machinery. We’re proud to be a part of the world-class Cat brand and offer you the best commercial truck, construction, agricultural and power generation equipment in the business. Equipment Rental to cover you in case of an emergency or when you need specific equipment. Power Systems Sales & Service (including powerful Cat generators). Access to our Large New & Used Parts Inventory for regular maintenance and repairs. Service for your Construction Equipment (as well as agricultural machines). Large Truck Sales & Service for all makes and models, as well as complete glider kits. At Thompson Machinery, you’re getting friendly and personalized small-town service with the resources and reach of Cat. This means we can find custom equipment solutions that suit you and help your business grow. You can add to your bottom line when you team up with Thompson Machinery in Columbus, MS and benefit from our experience. Choose from a large selection of equipment including mini excavator, telehandler, skid steer, backhoe, dozer, compact track loader and much more. With over 70 years in the business, we’ve been satisfying local construction and agricultural customers for a long time and will continue to do so for your business. Whether you’re a new Thompson Machinery customer discovering us for the first time or a longtime patron who keeps coming back, we’re here to take care of your unique needs and expectations. We have more than ten locations spread across Mississippi and Tennessee. This means we’re closer to you and can offer you better service and support. In Columbus, we have a dedicated team of sales reps, technicians and construction equipment experts with the training and experience it takes to support your business. It doesn’t matter if you’re contacting us for new and used equipment sales, machine rental, power generation equipment, purchasing parts for equipment maintenance or truck sales and service. No matter who you are, we’ll give you the expert care and attention-to-detail your business deserves. We make it easy to contact us. If you’re in Columbus, we invite you to drop on by and visit us. We’ll show you our facility and tell you more about what we can do for you. You can also give us a call, send us an email or use our online message system. In all cases, someone will get back to you quickly with the information you need. If you are looking for a rental please view our large selection of rental equipment which includes telehandlers, backhoes, mini excavators, skid steers, compact track loaders, dozers and a large number more of rental equipment. Rent for long for short term with rent to own and delivery available. Come and find out how we’ve become a local leader in construction, agricultural and power generation sales, rentals and service. Thompson Machinery combines a local approach with the backing of a global giant like Cat to cover all of your equipment needs, so contact us today to discover what we can do today and get your free quotation. Thompson Machinery in Columbus, MS offers New & Used Equipment Sales, Equipment Parts & Service, and Equipment Rentals.